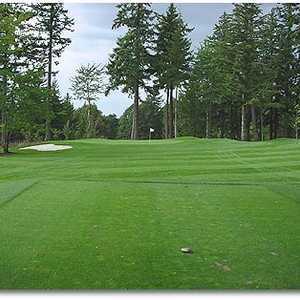 Mountain View Golf Course is located half way between downtown Portland and Mt. 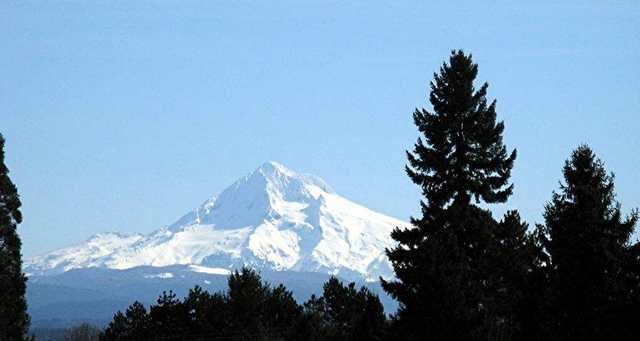 Hood in Boring, Oregon. This 18-hole course stretches for 5,926 yards from the blue tees and is an excellent course for those of you who are looking for a challenge. Rolling fairways lined with trees and greens with well-placed bunkers await the unprepared golfer. The biggest attraction at the course is signature hole #12. This is one of the most unique holes in the Portland area. It's 184 yards from the blue tees and 180 feet down (that's almost 18 stories). If you would normally use a 4 or 5 iron for 184 yards, you better switch to an 8 or 9 on this one. Check out the hole in our photo gallery and then call for a tee time. First of all, their idea of course maintenance is to make sure it doesn't turn into a cow pasture! They just do barely enough. Secondly, they don't care about speed of play. 3 groups backed up by a fivesome? Call the pro shop? They literally said "we don't care!". Third, some of the tee boxes and greens, especially on the backside, are an embarrassment to golf. They obvious don't care as these conditions have existed for years. Finally the driving range is run like a third world country. Hours? Whenever they feel like it! It closes at the oddest hours. Balls? Who needs balls? They routinely "forget" to pick them up and then run out. Don't get me started on the ball machine! It only works half the time. Overall, they just don't care, so why visit? I thought it was enjoyable and the people are nice! Played at a lot of different courses in several states. Some were poor courses but enjoyable none the less because you were greeted by pleasant people and received good service. Unfortunatly dont expect to find a good course and the people in the pro shop certainly wont impress you. I dont understand anyone who would give this course anything but a poor review. I know they have a lot of cheap specials but there's a reason and it's not because people are beatin their door down to get lousy service on a lousy course. This course is a nice layout for the most part but course quality has dropped off a lot in recent years. Fairways are so rough you can barely drive a cart on them and the cart paths aren't much better. Used to play here quite a bit but has gone way down my list in the last couple years. I've played this course probably over 100 times and every time I get a little more disappointed. Reading some of the really positive reviews on here makes me laugh because this course is junk! The only thing that I like about this course is their driving range (even though you hit off mats) and putting area. The course itself often times looks run down and not well maintained. Fairways are either dried out and brown or soggy and unplayable. The greens are usually littered with sand and sometimes missing grass. If you are new to golf, this course is great for you. But if you have played a lot of golf, it's not worth the time. Save your money and play the Resort or Gresham. I also have to say that some of the staff is rude here. The people mowing never stop when they see you and some of the people in the pro shop can be rude depending on the day. I've met the owner a few times and in the golfing community he is know as a real jerk! Sorry this is such a negative review but I thought there should be a truthful review on here. Play this course at your own risk! I will say tho it is a good value. The staff knows its a junk course so it's priced to get people playing. Minor point of clarification...........ooooopppps. That would be the first of 5 in my 30 year golf career. #13 at Mountain View was the first of what a very luck guy had in total, not just there. Whooooo Hoooooo. 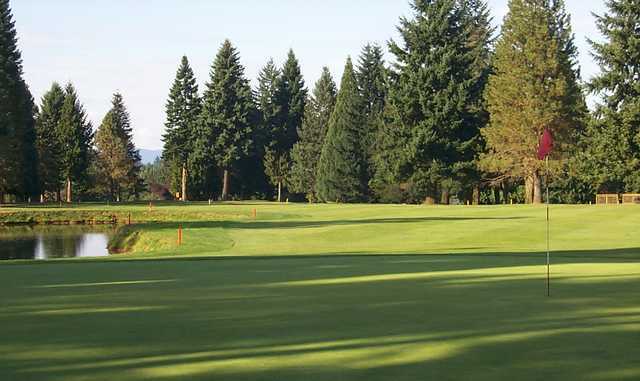 One of the best golf courses in the PNW for both beginning and advanced golfers alike. I have played many rounds at Mountain View throughout my career in golf. It was the site of my first of 5 holes in one on hole # 13. Almost as good as the shorter but similar golf Madrona Links golf course in Gig Harbor Washington. Lots of character and characters around the greens and some spectacular topography on the front and back 9's. I've played this track many times, and I must say. It challanges you every time. The greens are sneeky fast. Especailly the slopy ones(#12,14,15,17). You better be below the hole or you're talking about a 4-5 putt. Clubhouse is beautiful with a spectacular veiw of Mt. Hood, but I feel sorry for the boys who keep up the grounds. I've never seen so much moss on a maintainance facilities roof. LOL!! Mountain View GC staff are good people. Not too stuffy! Lovely course. Well kept. Greens in beautiful condition. No. 12 hole spectacular. However, greens too fast, unfair for fast play, too much pitch making it diffucult to stay on greens, will not hold approach shots. Enjoyed everything but greens. We play this course often-- all year round! It is a fun course, with many challenges and rewards! The greens can be a test for the best golfer; pin placement is everything! Great people work there-- always pleasant and helpful. Ladies, Come On Down. The 18-storie drop on 12 is pretty cool, but there're plenty more fun challenges on this 18-hole track. The people are friendly and They have a woman's group that plays 3 times a week including weekends. Breakfast is available before you hit the links, and when you've put away the stix for the day, you'll love the pub-fare and pizza at The Leaderboard located in the clubhouse. This is a beautiful course, challenging but forgiving, the customer service was great down to the marshall, however be sure they didn't just sand the greens due to the liquid Oregon sunshine because they were the fastest greens me and the foursome I was with had ever played, a little too fast. Overall I would love to go back and take another shot at 12. Used Golf Now to book online. Has to be the "best" value in Portland for $20 ( 18 holes with cart and practice balls ). Very fun layout ( WOW , #12 ). Mountain View greens are awesome and very fast. You need to stay on the low side of the cup. Only problem is the rain - I'm from Texas , I would definetly reccommend this cousre to all. The food was excellent - french dip with a cold beer. The service in the Golf Shop was friendly and wished us back again to play the next time we're in Oregon. I have been playing this course my whole life and still to this day I love playing it because it never gets old. My game improves each time I play here. During the summer, it is very beautiful and it has a great view of Mt. Hood. The prices are pretty good. It is definitely one of my favorite courses! #12 is exceptional. Although I don't always hit the green, it's a spectacular hole with a great view! Pin placement on #14 & #15 are super tough, especially if their on the lower left on #14 and upper right on #15. The Staff is Great, especially Pat who is "Always On His Game". As far as getting on the course.... I've never had to wait more than 15 minutes. 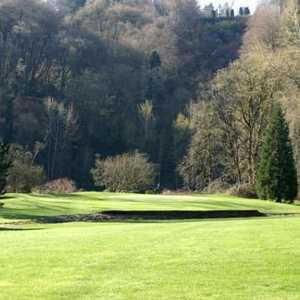 That's great, as it's still considered a Portland Area course! I played this course for the first time yesterday. It is now one of my favorites and I will be returning. 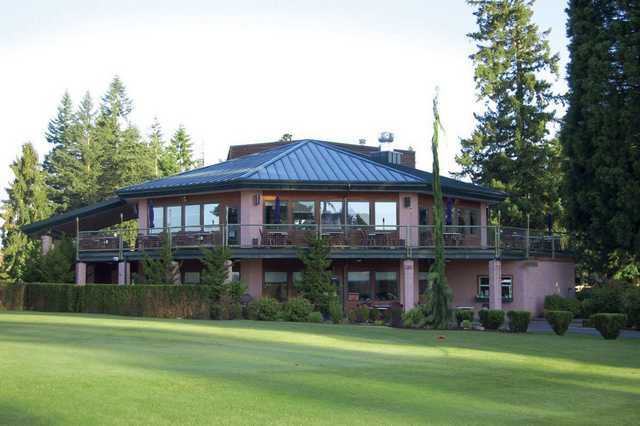 I found the staff to be courteous, the food good and reasonably priced, and the course in excellent shape. Just enough water and traps!. #12, what can I say. It took me two holes after to get rid of my goat legs. And just a 30 minute drive. Overall a reasonably good course. I have played it on and off for over 30 years. The variety of the holes is nice, and the greens are usually good. There are a few very frustating things about this course however. First, nobody who works there seems to care about speed of play. They will allow amazingly slow groups just to wander along and say nothing to them. Even when you call the club house during the round and say there are 3 groups backed up and the slow group has 2 full empty holes ahead, they simply say "sorry, can't help you". I have heard this from many others also. The other thing is that the tee boxes on 12 and 13 are atrocious. Very tacky, and the owners seem to have no desire to improve them. My husband and I play this course often. The fairways and greens are beautifullly maintained ... and has a great view of Mt. Hood! My game improves each time I play here. It is definitely one of my favorite courses! This is a well kept course and not crowded. The price is great and it has a good variety of holes. There are not a lot of water or sand trap hazards, but if you can't drive fairly straight, your ball will end up in the houses that border the course. That made it fun. The number 12 hole is awesome... using the 9, I actually hit it past the hole into the creek area, and had to take a drop. Definitely a hole you need to be accurate on. Probably one of the funnnest holes I have played. 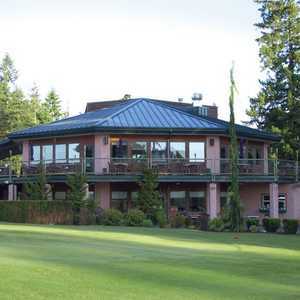 The staff was really relaxed and helpful, and the clubhouse is much nicer than many I have seen. Good pro shop too. I did not use the range, but it looks good. It is narrow, like a fairway. I will be returning often. I have now played 5 rounds of golf at this course, and enjoy it very much. Although it is not a perfect course (driving range coming up both 9 and 18 can be a bit of a distraction), it is challenging and, as my wife says, very pretty. The pro shop and deli staff are nice and accommodating of about any requests you may have of them. Now that I have found Mountain View, I will continue to play here often as it has a "feel" that I like, and is not overly crowded with the pretentious golfers "better" courses seem to attract.